The EZ-RESTORE OVERDRIVE features a 1,100-joule output at 12 kV. A DC output of 12 kV to indicate breakdown voltage is optional with this unit. 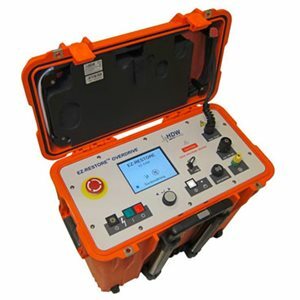 Possessing a measuring range up to 25,000 feet, the EZ-RESTORE OVERDRIVE offers fault-distance accuracy less than 2.5 feet (depending on displayed range). Additionally, the system allows for computer-controlled automatic sectionalizing and fault locating with a simple “turn and click” operation.